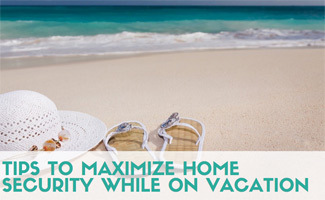 When it’s time for vacation or the holidays the last thing you want is to worry about a home break-in. These tips will give you peace of mind while you’re spending time with loved ones or relaxing on vacation. There are some elements of your home’s location that you can’t change (like being set far back from roadways or being isolated from close neighbors), but there are things you can do to minimize the chances of a break-in. Keep in mind that most thieves are not professionals, so a few small steps can go a long way in taking you off their radar. Below are ten home security tips to give you peace of mind while you’re gone. Use home automation systems so your lights switch on and off at normal hours, giving the illusion that you are home. Consider finding a college or high school student to live in your home while you are on vacation, especially if you are traveling for an extended period of time. Regardless of whether you have pets, the movement of vehicles and other items will give the property a ‘lived in’ look. Put in an official hold order for your mail via USPS so that newspapers, packages and other items that may cue thieves you are out of town are not left out. Consider starting those holds a day before you leave to ensure there are no glitches. Have someone cut your grass if you are gone longer than ten days and be sure to stow away garbage and recycle containers. Test your smoke detector to make sure it is in working order. Better yet get a smart detector that will send alerts to your phone, so you’re alerted to smoke or CO before it becomes a danger. Tell a trusted neighbor about your travel plans, including dates of departure and return. Ask them to keep an eye out for unusual vehicles or activity. Lock all doors and windows (don’t forget upstairs windows). It sounds simple, but almost 30% of “unlawful entry” cases are through unlocked doors and windows. Get an alarm system. There are home security systems to fit just about any budget. At the very least, we recommend you put home security signage and stickers around your home to deter burglars, especially if there’s a history of break-ins in your neighborhood. Wait to share vacation stories and images until after you’ve returned. This includes turning off geolocation tagging on social media (the features that post your location along with your comments). Lock any vehicles that are left behind and leave spare keys with a trusted friend in case there is a need for entry to your cars or home while you are away. It could be something as simple as you forgot to take out the trash bags on your way out or something as unexpected as a need to access your home to assess storm damage. The holidays are an especially prime time for burglary. While you’re making a list and checking it twice, keep this list of holiday safety tips in mind so you’ll have the happiest and safest holiday season. Use smart plugs to program your Christmas lights and other electronics to automatically switch on and off at regular intervals, giving the illusion that you are home. You can also control your smart light bulbs and other gadgets from your smartphone. Install a doorbell with a camera to see who’s at your front door when the doorbell rings (even when you are away). Often burglars will pose as solicitors to see if someone’s home. Santa might pop down through the chimney, but thieves come into your home in more traditional ways. If your door is wood or glass, upgrade your door to stainless steel so it won’t easily break under pressure from an intruder. Deadbolts are effective, but make sure they’re the kind that require a key on both sides or that you have a secondary lock as well. Better yet, get a smart lock that’s more difficult to pick (and have alarms built in). Put up an outside security camera to indicate that your home is under surveillance. Keep blinds and curtains shut when not at home and valuables out of clear sight from outside. A safe is a worthwhile investment to keep essential documents and higher-ticket items out of reach of visitors and potential intruders. Trim the tree (and shrubs too!). While you’re focused on having the prettiest Christmas tree on the block, also ensure you’ve pruned your bushes, leaving no place for burglars to hide and peek inside. And this allows neighbors to see your gorgeous holiday decorations! Christmas tree fire safety should be top of mind too. Sadly, people often neglect Christmas tree safety. Hot lights and dry needles can be a disastrous combo, so keep that tree watered and turn off those twinkles at bedtime and when not in use. You should also invest in a good base (like Genie XXL), so your tree is properly anchored. The last thing you want is all your fragile ornaments to come crashing down accidentally and potentially damaging your house or hurting someone. If you’re expecting deliveries, Amazon Prime now offers the ability to deliver packages to a third-party location or nearby lockers so you can rest assured your goods are in safe hands if you’re not at home to accept them (also comes in handy to keep surprises away from kiddos). Amazon’s Key service gives participating customers remote access to delivery people to put packages inside, assuming you’re comfortable letting strangers (even “official” ones) unattended into your home. Christmas holiday safety tips go beyond physical safety. Cyber Monday and online shopping is an opportunity for hackers to steal your credit data and identity. Use a VPN when using public WiFi and sign up for identity theft protection, so you’re immediately alerted if there is any suspicious activity. This proactive step will help you respond quickly and recoup your losses if an incident occurs. The video below has some added advice we recommend you consider to ensure maximum security. Here’s a handy graphic we created to show these 9 easy to apply tips in action. Hopefully you’ve found some of these tips actionable and can have peace of mind as you drive or fly away to your holiday, allowing you to get the break you need and truly enjoy your time away. Special thanks to Ellen Dudley, a REALTOR in Winston-Salem, NC for providing her expertise and insights into some of these holiday security tips. Got any safety tips of your own you’d like to share? I totally always forget to lock our windows, even though we’re on the 2nd floor of a building doesn’t hurt to lock up so I’m glad I read this and did that before leaving town!